Elasticsearch 5.x: Stores all of the logs. Logstash 5.x: Processes the incoming logs for a log-forwarder i.e. Filebeat. 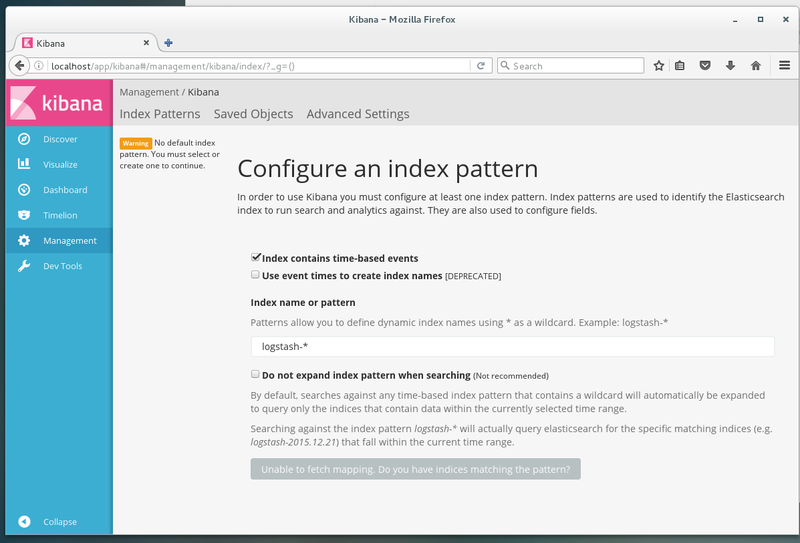 Kibana: GUI for searching and visualizing logs. Filebeat (Log Forwarder is also an option): Installed on servers that will send their logs to Logstash. We will install the first three components on a single server, which we will refer to as our ELK Server. The Filebeat will be installed on another machine i.e. ELK client, who’s logs we want to visualize. The above command will disable SELinux for the session i.e. until next reboot – to permanently disable it set SELINUX=disabled in /etc/selinux/config file. As clients will need to connect to ELK server to send logs (port 5044). It’ll start the Kibana as service, listening on port 5601 (by default). Connecting to artifacts.elastic.co (artifacts.elastic.co)|184.73.171.14|:443... connected. You can access your Kibana dashboard directly http://localhost:5601 – but in case you need to access your dashboard from a remote machine, we must setup a reverse proxy i.e. Nginx. With Nginx you can access the Kibana dashboard externally elk_server_ip (Nginx will be listening on the default 80 port). 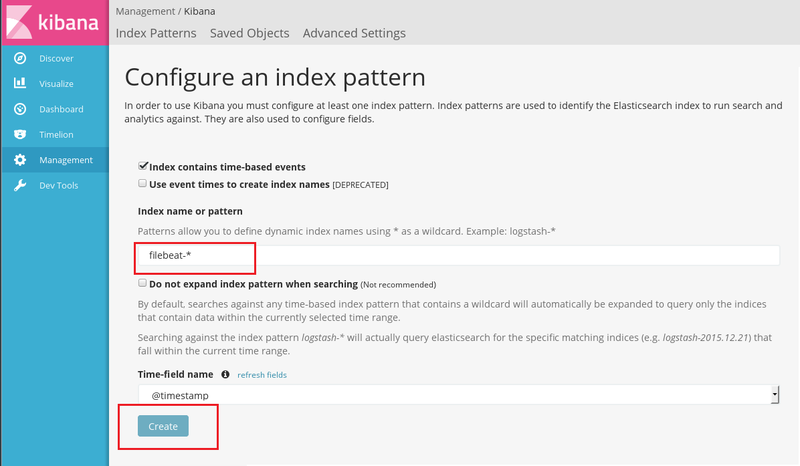 For test setup you can simply skip this step, and use Kibana directly. Save and exit. This configures Nginx to direct your server’s HTTP traffic to the Kibana application, which is listening on localhost:5601. Also, Nginx will use the elk.htpasswd file, that we created earlier, and require basic authentication. 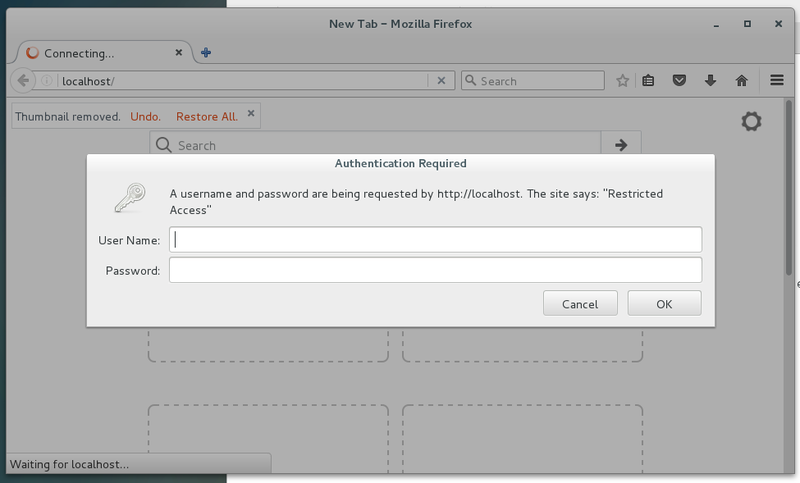 Hit the http://localhost using any browser, it’ll prompt you for the kibana username:password, you set earlier. You’ll have the “Error – Index Patterns: Please specify a default index pattern“, appearing at the top of the page, which is fine by now. Create logstash.repo at /etc/yum.repos.d/ and paste the following lines in it. Add a SSL certificate based on the IP address of the ELK server. Add the ELK server’s private IP in /etc/pki/tls/openssl.cnf. Logstash configuration files are in the JSON-format, and reside in /etc/logstash/conf.d. The configuration consists of three sections: inputs, filters, and outputs – usually specified as separate files. Insert the following lines into it. This is necessary for Logstash to “learn” how to process beats coming from clients. Make sure the path to the certificate and key match the right paths as outlined in the previous step: This specifies that Logstash will listen on tcp port 5044 i.e. log-forwarder will connect at this port to send logs. This filter looks for logs that are labeled as “syslog” type (by Filebeat), and it will try to use grok to parse incoming syslog logs to make it structured and query-able. In output.conf basically we configured for Logstash to store the beats data in Elasticsearch which is running at localhost:9200, in an index named after the beat used (filebeat, in our case). We will show you how to do this for Client #1 (repeat for Client #2 afterwards, changing paths if applicable to your distribution). The authenticity of host '192.168.40.175 (192.168.40.175)' can't be established. ECDSA key fingerprint is 42:81:19:1a:4f:84:cb:37:81:e8:8c:dd:8f:ac:7f:ff. Warning: Permanently added '192.168.40.175' (ECDSA) to the list of known hosts. Note: Filebeat’s configuration file is in YAML format, which means that indentation is very important! Be sure to use the same number of spaces that are indicated in these instructions. If all the installation has gone fine, the Filebeat should be pushing logs from the specified files to the ELK server. Filebeat (probably running on a client machine) sends data to Logstash, which will load it into the Elasticsearch in a specified format (01-beat-filter.conf). Filebeat (log-forwarder) may not be able to send logs to ELK server (Logstash), one probable reason can be improper SSL configuration i.e. you may find the following error in the filebeat logs or simply using journalctl -xe command. Verify if SELinux is disabled. Update you certificates i.e. generate new certificates. Sync the times on the ELK server and the clients – Syncing date and time using ntpd. Final resort can be disabling the SSL on logstash – comment/remove the ‘ssl => true‘ in the Logstash’s input.conf (01-beats-input.conf in our case).